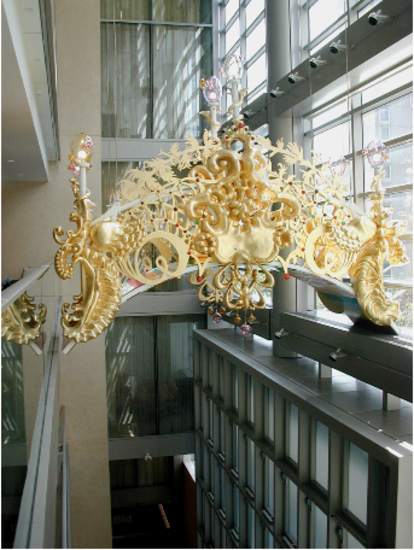 New York, NY, April 30th, 2002 – Sotheby’s continues its “Art in Atrium” exhibition with New York artist Rachel Feinstein whose work will be on view in Sotheby’s soaring nine-story atrium beginning April 30th. Feinstein’s dramatic bridge sculpture entitled Satinstein will welcome visitors upon entering Sotheby’s lobby. Sotheby’s began it’s “Art in Atrium” program last year using the light-filled nine-story atrium in its newly-renovated New York headquarters as a venue for experimentation and invention in the field of Contemporary Art. The program provides selected artists with the space and resources to produce installations specifically for the site. Wrapped in glass and flooded with natural light, Sotheby’s atrium can be viewed from balconies on nine floors of the building as well as from the street outside. The “Art in Atrium” project is a philanthropic endeavor to support Contemporary Art and all artwork will be given to the artists at the close of each exhibition. Together with Sotheby’s, the Art Production Fund, a non-profit organization, oversees the selection, development and execution of this project. Following the inaugural installation one year ago of Jorge Pardo’s Lamps, Sotheby’s is continuing the project with an installation by New York artist Rachel Feinstein who has just exhibited at Marianne Boesky Gallery and was recently featured in “Statements” at the Basel Art Fair. At Sotheby's, the atrium is activated by her sculpture entitled Satinstein, which spans the top ledge of the entrance passage to the 4th floor level in front of the escalators. Satinstein, approximately 6 x 16 ft., combines the form of an animated arched bridge with a gleeful rainbow. The ornate object blends references of Baroque and Rococo architecture with surreal elements. 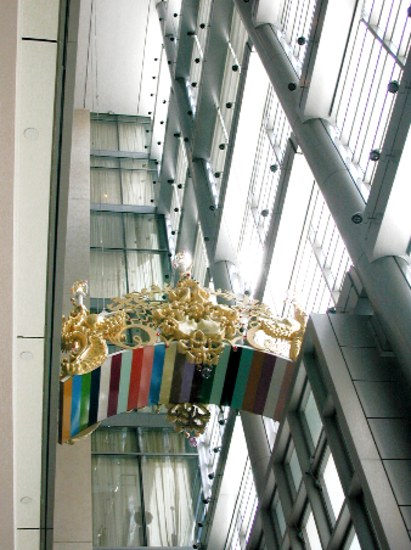 This site-specific sculpture is covered with intricate carvings, a gilded surface, and a spectrum of colorful paint. Satinstein welcomes Sotheby's visitors with a golden glow of fantasy, travel, splendor and hope. Rachel Feinstein lives and works in New York and is represented by Marianne Boesky Gallery, NY. Her Solo exhibitions include: 2001- Marianne Boesky Gallery, New York and "Statements", Basel Art Fair, Switzerland; 1999- Robert Prime Gallery, London and White Room, White Columns, New York. Group exhibitions include 2001- "The Americas", The Barbican Centre, London; 2000- "Pastoral Pop", The Whitney Museum at Phillip Morris and "Greater New York", P.S. 1/ The Museum of Modern Art, New York.